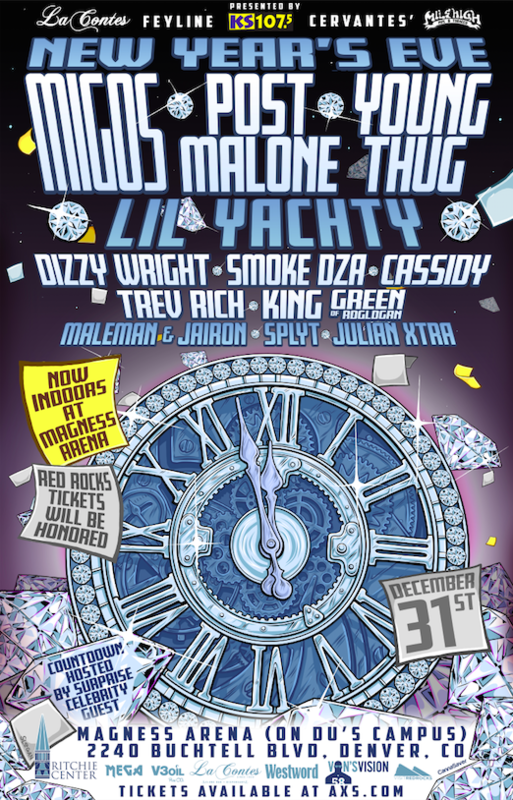 Morrison, CO – The New Year’s Eve on the Rocks event at the historical Red Rocks Amphitheatre in Morrison, Colorado — featuring headliners Migos, Post Malone and Young Thug — has been moved indoors. According to a statement from Denver’s Feyline Presents, the extreme weather is to blame for the move to Magness Arena, which is located on the Denver University campus and holds nearly 8,000 people. 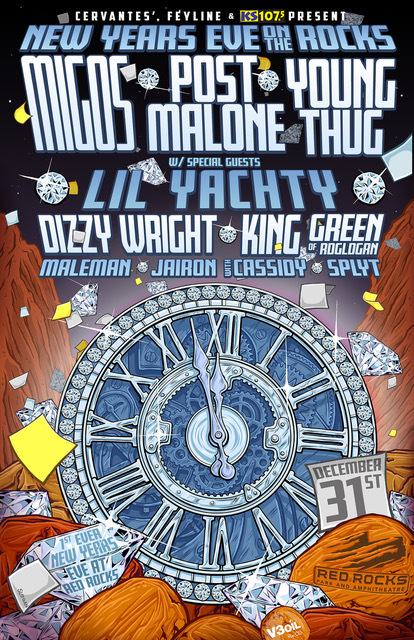 Denver’s Trev Rich, Smoke DZA and Cassidy — who were recently added to the lineup — will join Lil Yachty, Dizzy Wright, RDGLDGRN’s King Green and special surprise guests on (Sunday) December 31 to ring in 2018. The show is expected to go until 1:30 a.m. local time. 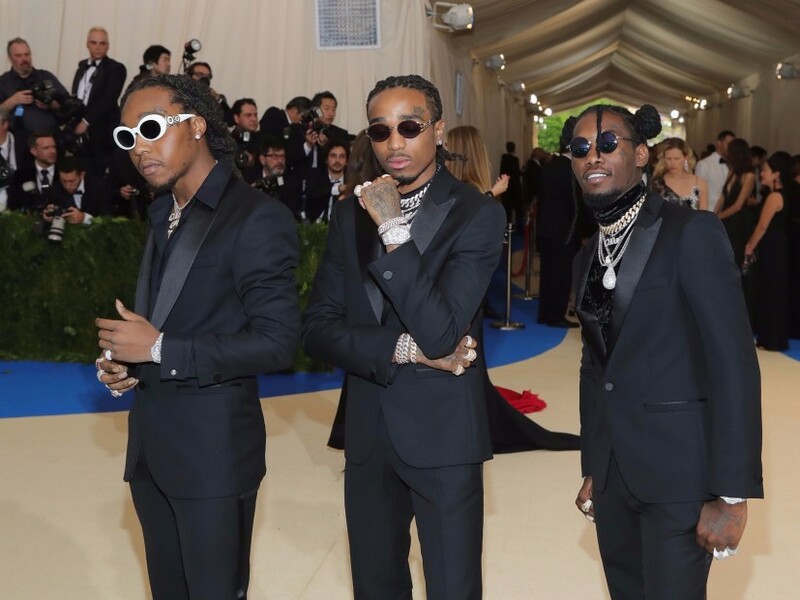 Migos, Young Thug, Post Malone and Lil Yachty are scheduled to headline Red Rocks Amphitheatre’s first ever New Year’s Eve event in Morrison, Colorado, 17 miles away from Denver. Spearheaded by Feyline, KS 107.5 FM and Cervantes, the event also features Dizzy Wright and King Green of RDGLDGRN, among others. Founded in 1906, the historic venue has become one of the world’s preeminent destinations for music enthusiasts and was recently named a bucket list destination by NME. From The Beatles and Bob Marley to A Tribe Called Quest and Gorillaz, countless artists have graced the stage since its inception. This isn’t the only time Red Rocks has hosted a winter event. In January 2014, Jurassic 5 and Ghostland Observatory headlined the third annual Winter on the Rocks concert. Despite the snow and colder temperatures, the event still sold out, and retained an air of magic throughout the evening. Pre-sale tickets kick off on Thursday (October 12) and will go on sale Friday (October 13). For tickets, head here. Joey Bada$$ Claims He Co-Wrote Post Malone's "Rockstar"
Who's gonna finish on top? Dave East Gets Dragged On Twitter For Calling "Old Town Road"
Kxng Crooked & Horseshoe GANG Cypher 2018 releases today!